For 28-year-old Brittany Hudson, the day she lay on the operating table for her weight loss surgery six years ago was at first a dream come true. "I grew up in a very traditional religious home, where women's roles are pretty defined. So a lot of the value was in 'How thin could you be? How beautiful are you?" Hudson told Vocativ. "I thought thinness equated happiness." At her largest, she was 215 pounds. By most measures, her procedure — also called bariatric surgery — was a success. But while she dropped 80 pounds in a year, she was unprepared for the mental nightmare that followed. For years, she battled depression and an eating disorder, binging and throwing up the little food she could swallow down and isolating herself from her friends. Ultimately, it would take six weeks at a rehabilitation clinic in 2012 and several years in therapy before she said found lasting relief. It wasn't until March that she had a firm handle on avoiding the vomiting and pain completely, she said. 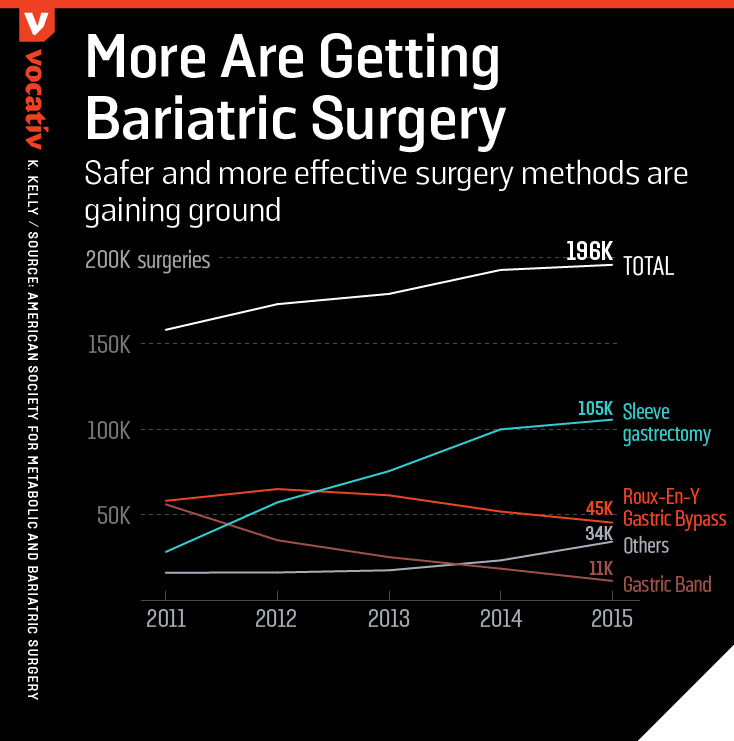 As bariatric surgeries like Hudson's have become safer and less invasive, they've steadily become more popular in the United States. While, today, surgery is typically only recommended (and covered by insurance) for extremely obese or unhealthy patients, some surgeons hope to see it even more common among younger and less heavy people — especially as U.S. obesity rates rise. For all its upsides, though, there are former patients like Hudson, as well as those in the medical field, who think there is a troubling lack of focus on its mental health consequences. The surgery certainly lives up to its name. By radically re-sculpting the innards of a person's guts, bariatric surgery is the only way known to reliably help people lose large amounts of weight and keep it off long-term. Patients lose an average of 30 to 70 percent of their excess weight, mostly within the first year, and other health markers linked to obesity, particularly type 2 diabetes, can drastically improve too. Others wake up without searing joint and knee pain for the first time in years. Essentially, there's no question these procedures have given many a new lease on life. But, still, Hudson's story isn't an outlier. Weight loss surgery blogs and message forums are littered with stories of those taken aback by the emotional hurdles of life after surgery, such as a man who struggled with feelings of sadness, self-pity, and anger five months post-surgery, or a young woman whose post-surgery pain worsened her depression, even as she hoped to lose the last elusive twenty pounds needed to reach her ideal weight. In research studies, women have talked about the shame and guilt brought on by "dumping"— a term for the vomiting and pain that occurs when patients eat more than their smaller stomachs can handle. Hudson herself used dumping to try to lose more weight after surgery. "Instead of coping and learning to find other ways to handle sadness without turning to food, I still tried to use it, just differently," she said. Although Hudson's life has since stabilized, with a loving husband and Siberian husky at her side, she still feels anger at the weight loss industry for marketing half-truths, and at doctors for providing little of the mental health care she now feels should be a requirement for every patient. She also believes bariatric patients need more attention after their honeymoon phase of losing weight quickly. Therapists and doctors agree that the mental health side effects of weight loss surgery are underestimated and under-explored. While immediate mental benefits are well-studied, relatively little is known about longer-term mental health effects, according to Amir Ghaferi, director of the Michigan Bariatric Surgery Collaborative. The research that does exist suggests surgery's psychological benefits can be temporary or uncertain, he told Vocativ in an email. On the positive side, there's good evidence surgery-induced weight loss can clear up feelings of routine sadness, and even help some recover from more serious cases of depression. One study found that surgery is linked to overall lower rates of psychiatric disorders three years later. Others show that people on average make more friends, date more, and generally enjoy their lives more, at least partly because their physical health improves. But the effect on depression might be short-lived, according to a longer-term study of patients published in 2014 in the journal Obesity. It found that many people eventually returned to the same pre-surgery level of depressed mood they were at three years later. More worryingly, some portion of patients may end up worse off mentally than before they went under the knife. A 2015 study found that 13 percent of patients experienced worsening depression six to 12 months post-surgery. Other have shown that bariatric patients are more likely to turn to psychiatric medication and have higher rates of binge-eating disorder and alcoholism than the general public. The very nature of gastric bypass may leave people vulnerable to drinking problems, since it lowers people's alcohol tolerance; a 2013 study found that these patients were five times as likely to report alcohol abuse than non-patients, and twice as likely to drink more heavily. And much like Hudson's experience, a 2007 study found that 12 percent of patients used vomiting to control their weight. Even divorce rates shoot up. Marci Evans, a Boston dietician and nutritionist who treats eating disorders, told Vocativ that part of the problem is many surgery patients are mentally unprepared. "What I can say, in my experience of working with clients, is that most people enter into bariatric surgery without having done a fair bit of psychological work on what their relationship to their body or food is," she said. While many patients do have an ongoing relationship with their surgical team or other doctors, at least for the first year or so, she said, they're often exposed to damaging messages from others around them. "The resources that are available for people in terms of support — online communities, classes they can go to — are often led by incredibly inexperienced people who are not qualified clinicians, but other people who have done the surgery," Evans said. She's seen dangerous dieting tips within these online communities that echo those promoted among people with eating disorders. Researcher Junaid A. Bhatti, author of a study published recently in the Journal of the American Medical Association, agreed that "not all patients will benefit psychologically or mentally" from bariatric surgery. His study found patients were 50 percent more likely to be sent to the hospital for intentionally hurting themselves — most often by overdosing — in the three years after surgery than the three years before (in total, though, only about 1 percent engaged in self-harm). And although there are many reasons why a patient might contemplate suicide or go through depression, the fact that rates go up in the second or later year following surgery, according to Evans, could indicate a growing dissatisfaction with plateauing weight loss and difficulty adjusting to a much stricter lifestyle. Massachusetts General Hospital's Weight Center psychologist Stephanie Sogg, who has been involved in the world of bariatric surgery for nearly two decades, is a staunch supporter of more expansive mental and behavioral health care in the bariatric field. Last July, she and her colleagues published a series of recommendations for the pre-op evaluation of patients' psychosocial health. But there's a bigger question, she said, about what kind of support is most worthwhile to improve: preemptive screening of potential surgery patients or longer-term follow-up and support following surgery. "There's always a tension." she said. It's almost impossible to say which is more important. Better screening may indeed be an important piece of the puzzle. In fact, more than 30 percent of patients seeking surgery have dealt with depression and anxiety sometime in their past; other studies peg the rate of binge eating disorders pre-surgery anywhere from 17 to 48 percent. And these latent hang-ups can create a vicious cycle, since poorer psychological health pre-surgery is linked to poorer weight loss outcomes. Any sort of perceived failure might then worsen a patient's outlook on life. Doctors also have to take more responsibility to not oversell the effect surgery can have on most people's mental well-being. "The average person does not become thin after having surgery," explained Sogg. "And even when people do become thin, you know, you'll still have arguments with your family. You'll still get stuck in traffic. Disappointments still happen. Heartbreaks still happen." Improving surgery methods could help. One of the few, if only, controlled studies that tracked the mental health of patients many years after surgery, published in the European Journal of Nutrition in 2015, looked at a small group of 36 surgery patients compared to a group trying to lose weight without surgery. 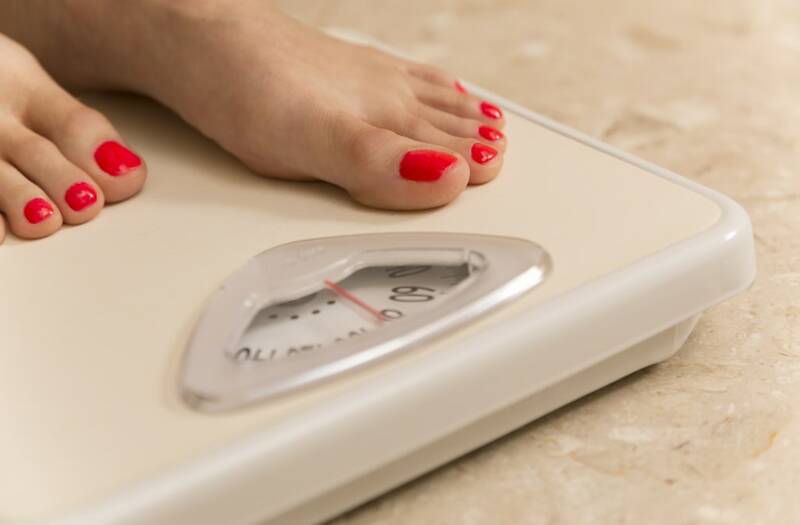 Over 10 years, the researchers found that despite their long-term success on the weight loss front, the patients' mental health on average deteriorated past even their pre-surgery level. The dieting group, meanwhile, had largely stayed the same mentally. But the small study only looked at those who had undergone an earlier method of bariatric surgery that uses a so-called gastric band, which has since fallen out of favor for being less effective and more likely to fail. Gastric bands only restrict how much food enters the stomach, rather than wholly reconfiguring a person's digestive system. And more radical procedures don't just shrink the stomach and colon, they also cause dramatic hormonal changes that alter the brain and gut, dulling a person's appetite. So the greater physical effort gastric band patients need to stay thinner could very well contribute to feeling worse, mentally, after the procedure. In the end, perhaps the most important question is whether people ultimately regret their decision to go through surgery. It's one that Sogg has posed to somewhere around 4,000 patients during her career, she estimates. "Nearly universally, people say 'I would do it again,'" she said. Experts agree, however, that it's important for potential patients to be vigilant about how they choose to get bariatric surgery. Mental health problems don't have to be a dealbreaker, but seeking psychological care beforehand and afterwards can be crucial. Sogg also thinks doctors need to better convey more realistic expectations for patients about "what in their lives may or may not change." Despite her troubles, Hudson doesn't regret her surgery. As unfair it is, people do treat her better since she's gotten thinner, and she's been more active. She now feels more in control of her life than ever before, thanks in part to her work with a body-positive therapist. She's learned to eat more intuitively, without triggering binging episodes and puts less stock in the number on the scale. But, still, Hudson thinks surgery should always be a last resort. Much more important a priority, she believes, is preventing obesity in the first place. There are also things she would have wanted to tell herself and now others before they explore surgery. "Surgery may be a bit better of a tool, but it's always hard to lose weight, no matter who you are," she said. "It's a hard road to walk without the right support." The post The Dark Side Of Weight Loss Surgery appeared first on Vocativ.